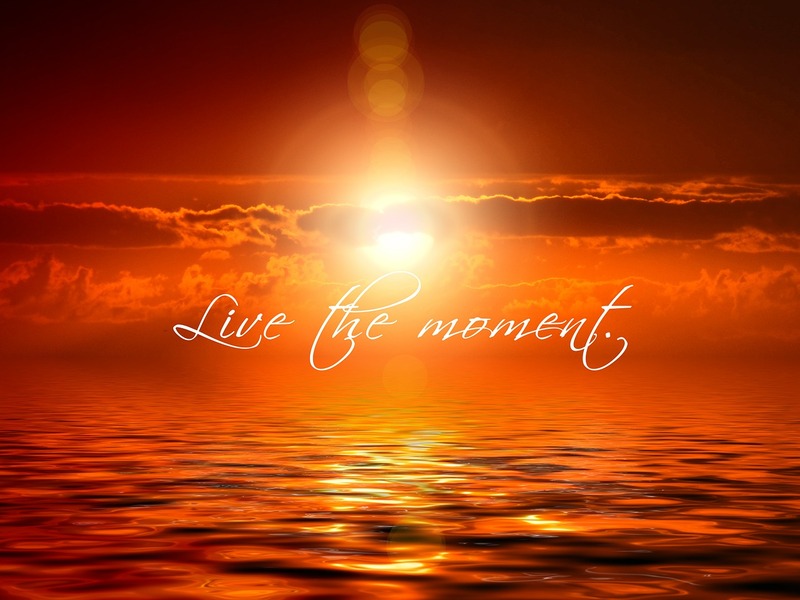 ‘Just Do It’: Live Moment to Moment! “Yesterday is history, tomorrow is a mystery, and today is a gift; that’s why they call it the present” (Eleanor Roosevelt). Take a minute to think about a normal day in your life. What are you doing? … How are you feeling? … What are you thinking? … Where are you going? … Who are you with? We all spend a lot of time thinking about things that have already happened – the past, and planning for or worrying about things that might happen – the future. Why did I end up in an argument with my friend last night? … When will I get to ring the bank about that loan? … When will I get the time to complete the report for my manager? … What date is the training course next month that I need to apply for? … Will I get home this evening to cook dinner etc.? Our days are filled with urgency and action, running from task to task, planning session to session, re-living conversation after conversation. We fill up 24 hours a day, every day. We scarcely have time for ‘being’ anymore or even ‘catching our breath’. Mindfulness meditation is the practice of directing attention, with kindness and compassion, in a non-judgmental way, to what is happening in the present moment. Mindfulness is a simple, practical skill which helps us find calm and stability in our relationships with ourselves and others in the midst of our busy, stressful lives. We can all practice mindfulness. We all have at least one minute in a day, where we can stop what we are doing, focus on our breathing and simply ask, ‘In this moment, how am I’? Many people associate meditation with spirituality. However, simple meditation may be used as a tool towards holistic health and mind/body integration. Practising mindfulness is learning to slow down, make time for yourself, nurturing calmness and self acceptance, purposefully allowing your body and mind to rest in the moment, no matter what is ‘on’ your mind or how your body feels. Practising mindfulness helps us to wake up to our lives, to what is happening in this moment. By being in touch with the present moment, we can shape the moment that follows and in this way, we can influence our future. So we need to practice ‘non-doing’ or simply ‘being’. The result is letting you be in the moment, with things exactly as they are, without trying to change anything. “Realize that this very body, with its aches and it pleasures… is exactly what we need to be fully human, fully awake, fully alive” (Pema Chodron). So if you fancy trying out a simple mindful practice that you can do at any time of the day, sitting in your office, in the car, at home, in the park, have a read through the following guide. After, when you are ready to try out the practice, try and sit in a comfortable position, with your back in an upright position, your shoulders relaxed, with both feet flat on the floor, hands on your legs facing up or down. (Once familiar with the practice, you can close your eyes if you want or focus on a spot on the wall or floor ahead). Notice your breathing. Take a deep breath through your nose filling your lungs and breathe slowly out through your mouth. Feel the air coming in through your nose and filling up your lungs, your chest expanding and your shoulders rising. Breathe out through your mouth and feel the air leaving your body. Slowly breathe in again. Keep the focus on your breathing, “being with” each breath. Every time your mind wanders off, notice what took you away and then gently bring your attention back to your breathing. Keep breathing in the slow rhythm that is soothing and calming. Ask yourself ‘In this moment, how am I’? When you are ready wiggle your fingers and toes, open your eyes and return to the place where you are. Now that you have tried out this practice, take a moment to think about how you feel right now. Over a few days, and with small practice sessions like this, you could aim to do 5-10 minutes mindfulness meditation practice each day, which will really benefit your overall health and well-being. Alternatively, another nice simple practice is to take 3-5 minutes to connect with your five main senses. For 30 seconds to one minute for each sense ask yourself, in this moment, what do I hear? What do I see? What do I feel? What do I smell? What do I taste? Mindfulness has physical and psychological benefits for everyone. Your life is busy and mindfulness is an excellent tool to promote and enhance your self-care. So follow the advice of Nike’s marketing giants and instead of saying I’ll start tomorrow or do it later, ‘Just Do It’ now! If you are interested in learning more how you could integrate mindfulness into your life check out http://www.mindfulnessireland.org and www.mindfulness.ie . Reference: Jon Kabat-Zinn (2007), Full Catastrophe Living: How to cope with stress, pain and illness using mindfulness meditation. Previous PostBe Healthy, Be Happy: Are you up for the challenge?Next PostSelf-Care: Whose Job is it Anyway? "Ger was lovely and I felt really listened to when I talked about my family & how I was coping with some problems we were having. I've been more aware of trying to find some 'me time' in my life, despite all the other stuff that is going on" - Coaching Client, November 2014. "I'd like to say thanks for the different training I attended that you led. I found you an inspiring facilitator and colleague and I was motivated, both professionally and personally, by your positive, grounded and honest approach. Lucky the folk who you will work with you next!" - Training Participant, December 2014. "I was very fortunate to have been introduced to Ger for support in moving on from a difficult situation. Ger helped me gain clarity on my issue and guided me on a new career path. She is a great listener and pragmatic in her approach to difficult situations. She is very generous with her time and gives 100% to her clients" - Coaching Client, July 2014.